PAT testing- Portable Appliance Testing, is an electrical inspection that involves testing all of your electrical appliances. In a commercial property, this is usually a necessary part of your electrical maintenance and servicing. But it can be time consuming. So is it really necessary? And what kind of benefits are there in organising regular PAT testing? Well, here at Walker Electrical, we are Preston’s leading electrical experts. And we work with companies and businesses across the North West, to deliver effective electrical solutions, including PAT testing. As a result, we have produced this guide to the advantages of commercial PAT testing. Meeting the Electricity at Work Regulations 1989- These regulations make it the responsibility of the employer to determine that all electrical equipment is safe and fit for purpose. A PAT test will provide paperwork evidence that will support claims that you are taking your electrical responsibilities seriously. Find faults- During a PAT test, a trained and professional electrician will inspect your electrical appliances, and will be able to find any areas of wear and tear. Things like worn out cables and washers can be small fixes, but they are absolutely necessary to prevent electric shocks, fires and accidents in the workplace. It also means your appliances can be fixed, before a full break down, which will save you money on expensive replacements. 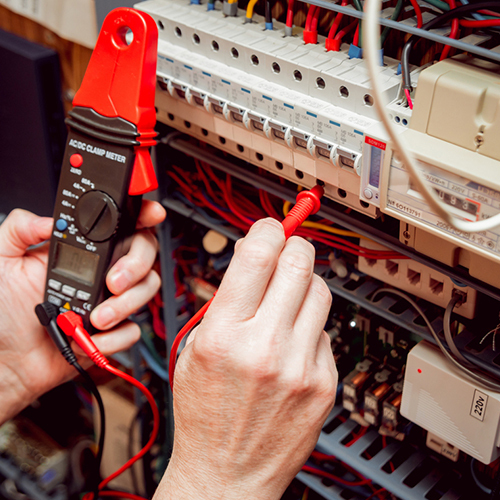 Insurance- if something does happen in your commercial property, such as a fire or an electrical accident, the insurance companies will not pay out unless you have proof that your appliances have been PAT tested. This means that PAT testing can make sure you get your payout, should anything go wrong.